Poor turnout of people reportedly forced Chief Minister Vijay Rupani to pull out of an election rally at Visavadar on Monday. Visavadar, which falls in Junagadh parliamentary seat, was one of the five venues of Rupani’s rally for the day. Later in the day, Kharvas or the fishing community in Porbandar also boycotted a rally of the chief minister. Videos of the CM’s scheduled rally at Visavadar showed several rows of empty plastic chairs with few people in attendance. A BJP source in Junagadh district unit confirmed that the CM pulled out of the event for the OBC that was scheduled to begin after 10.30 am. The event was in support of BJP candidate from Junagadh, Rajesh Chudasma. Apart from Visavadar, Rupani was also scheduled to attend meetings at Keshod, Upleta, and Porbandar on Monday. “Rupani was scheduled to join senior party functionaries at the event. 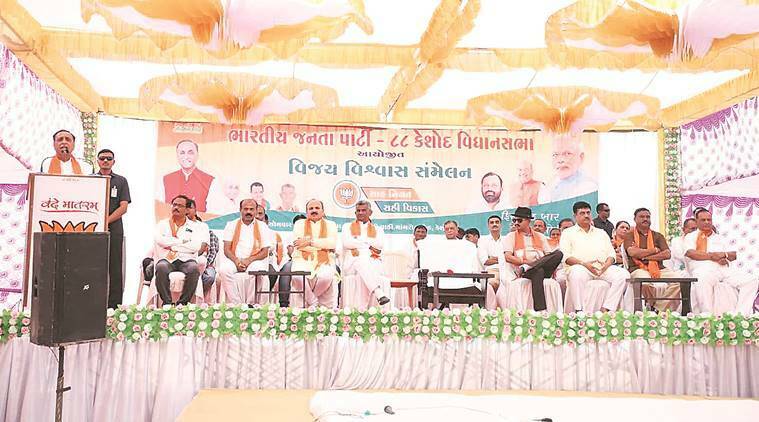 But then he changed the plans,” said a BJP office bearer, claiming that Rupani instead decided to attend BJP president Amit Shah’s event at Kodinar, located about 80 km away. However, the Chief Minister was not present at Shah’s Kodinar meeting. Meanwhile, Kharvas boycotted a BJP election meeting addressed by Rupani at Sudama Chowk of Porbandar allegedly at the behest of BJP MLA Babu Bokhiria. “We had decided not to go out for fishing and instead take out a rally to felicitate the CM. However, at the last moment, Bokhiria told us that there was no need for Kharvas to attend the meeting of the CM,” Ashwin Jungi, vice-president of Shree Porbandar Samast Kharva Gnati, an organisation of the Kharva community of Porbadar told The Indian Express. Phone calls to Bokhiria, the BJP MLA from Porbandar Assembly, and Vikram Odedra, president of Porbandar unit of the BJP, did not elicit any response.